On the totem pole of armor plated badassery, each of these cars rank well above the impenetrable trucks you see Brinks using to collect cash from banks, but somewhere below the presidential limo. Unlike The Beast, though, you can buy each and every one of these -- perfect if you're the type of person who expects a band of heavily armed robbers to attack you at any given moment. They might not be fire-breathing monsters, but they'll certainly keep you safe. Fact: some of the most insanely badass armored vehicles you can buy are Canadian. This is the Huron; it's so heavily armored you almost definitely don't need the level of protection it offers. Then again, can you afford to be wrong? For nearly 30 years, this German company has specialized in making sure no one can hurt you while riding in one of their vehicles. Their Toyota Land Cruiser is designed to offer some solid protection from armed gangs -- you know, things like rifles at 30 feet. Plus it’s equipped with a diesel engine to extend the range to over 370 miles so you can go from city to city without ever having to (dangerously) stop for gas. AA has been working with the G-Wagen for a couple of decades now, and unless you’re attacked by an actual army, you’re gonna be okay. The doors and windows can stop a .357 with full metal jacket bullets at point-blank range, which is a level of protection NATO deems good enough for most mid-level diplomats. The sky's pretty much the limit, though, and while they do ask for a little more money, they don't ask questions if you need your vehicle IED-proofed. You know the scene in Clear and Present Danger, when basically all of Colombia’s drug lords are trying to blow up Harrison Ford? Remember how he got out? The Suburban he was in got hit by an RPG, so he threw it in reverse, and rammed anything in his path. This is the non-Hollywood version -- chemical weapons inspectors in Syria get these. Night vision? Blast-proof undercarriage? Yeah, this has all of that and more. It also maintains everything that makes the S600 so great in the first place, like the glorious V12 engine (with extra protection in front so no one can take it out). You may or may not hear during your ever-so-stylish escape over the LOGIC7 surround sound. Some people say you shouldn’t ever attract attention to yourself if you really need an armored car, but if you’re in a Maybach that can withstand a .308 cal rifle firing armor-piercing rounds, you might as well sit back and sip your martini while your driver patiently waits for the light to change. No, really -- to prove a point about the safety, the ballsiest owner you'll ever meet conducted a live-ammo drill with nothing but glass between him and the business end of an AK-47. If blending in with other cars on the road really is your goal, TAC will beef up any vehicle you bring to their shop. Yes, that's a bright yellow, bulletproof Camaro you're looking at. Every vehicle the company touches comes with the option of adding a smoke screen, like you see in movies, but on a car like the Camaro, you'd think you could just do a burnout and get the same smokey effect. Texcalibur generally specializes in making armored cars for bank transactions, but that doesn't mean they don't make plenty of other bulletproof vehicles, like this Popemobile. 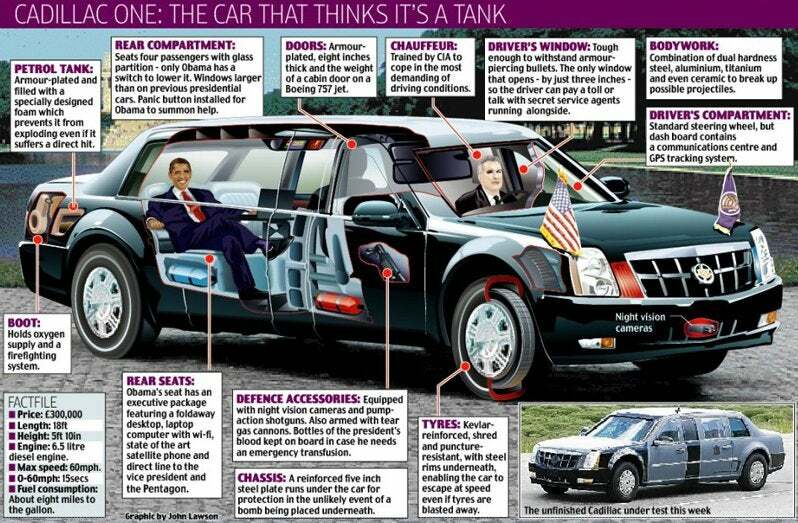 Technically it's called a "Presidential Vehicle." Sure, the glass is bulletproof, but come on, if you're in this thing everyone's gonna think you're the freakin' pope. Conquest is another Canadian-based operation that takes a fairly different approach to building armored vehicles, in that they basically build the things from scratch to ensure your safety is also super-luxurious. Somehow, this thing started out life as a Ford F-550 truck, before gaining a little armor weight, well, just about everywhere. It now tops the scales at 13,000 lbs. That includes kevlar-reinforced ballistic fiberglass for the fenders. Inside, the interior is 100% bespoke, and you can get it with wool carpeting, and suede covering everything else. There are actually quite a few companies that will rent or lease their armored cars. Diplomat Armored Rentals will give you everything from a discrete Camry to a Porsche Cayenne, and -- how's this for a badass option -- you can tick the box and the car comes with a driver who's fully trained for escaping armed thugs. Granted, most common robberies will hurt your wallet less than the $36,000 per week it'll cost you, but basic bulletproof cars start at a much more sane (but still expensive) figure. Aaron Miller is the Cars editor for Thrillist, and can be found on Twitter. He has a) never been shot at, and b) hopes he didn't just jinx himself by pointing that out.